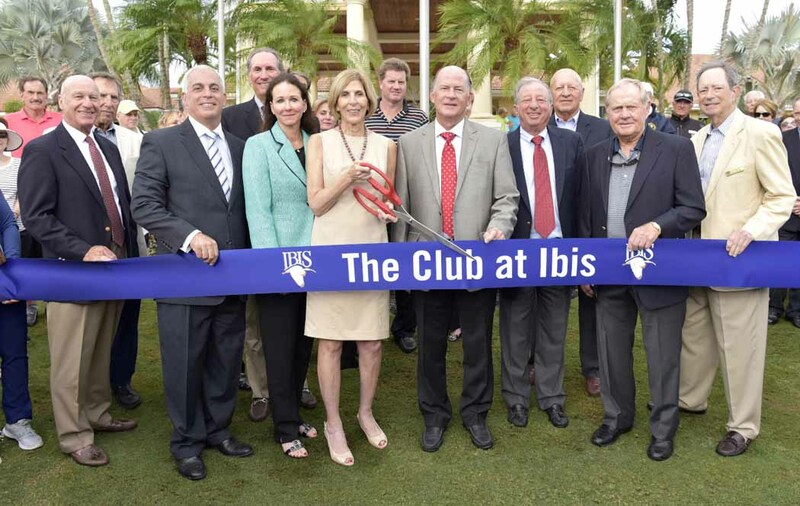 The Club at Ibis in West Palm Beach, Fla., celebrated the grand opening of its new clubhouse that added an additional 22,000 square feet, as well as amenities to every aspect of the high-end club’s operation. The clubhouse extension completes a $33 million Capital Improvement Project that included an all-new 28,000-square-foot sports village at The Club at Ibis, formerly known as Ibis Golf & Country Club. The South Florida property is the only community in the world to feature three separate golf courses by three different members of the Nicklaus family—Jack Nicklaus and oldest sons Jack II and Steve. To mark the occasion, Ibis members were joined by members of the Nicklaus family, including Jack, Barbara, Steve and wife Krista, as well as West Palm Beach Major Jeri Muoio, and Ibis management and staff. The extension increases space by more than 40 percent and allows new restaurants such as The Atrium and The Pub to move upstairs and take advantage of picturesque views of the Nicklaus Design courses. The Atrium Lounge, with its 23-foot ceilings, will provide a comfortable, casual setting for lunch and dinner on the upper level. Adjacent is The Pub, a gathering place for friends to watch sports in a casual setting as well as the 2,500-square-foot Pub Terrace outside on the veranda overlooking the Jack Nicklaus-designed Legend Course. For elegance, there’s The Grand Ballroom, which accommodates 450 diners or can be subdivided into three more intimate settings. The Palm and Ficus Rooms can serve as gathering spots prior to an event in The Grand Ballroom or can be used on their own for smaller parties. Among the highlights on the clubhouse’s lower level is Panache, a fine-dining restaurant that also can be used as a place for private parties and celebrations. Panache will also include a chef’s table area so members can watch their meals being prepared to add to their dining experience. The Golf Shop has been enlarged and features more merchandising space and the Golf Desk is centrally located to better serve Ibis members. The Locker Rooms have been enhanced, with the Men’s showcasing dark, masculine colors and the women’s utilizing softer tones. Ibis is introducing The Renaissance Room, a 1,500-square-foot space that will be the perfect setting for the clubs within the Ibis Cultural Association to meet for classes, lectures and seminars. Also new are The Game Rooms, which are four rooms fittingly named for the suits in a deck of cards—Spades, Hearts, Clubs and Diamonds. Ibis’ members took ownership of the club three years ago and quickly embarked on the $33 million Capital Improvement Plan to enhance the current members’ experience and to attract the next, younger generation.